Hand-cut 200 Dirham UAE banknote in a shadow box, 11 x 9 inches, photo courtesy Aicon gallery and the artist. Counting Falcons (Assembly series) (2015) is an example of one of Syed's works that are driven by activism in the form of poetic representations. The works comment on the hunting of endangered species of animals and birds, in this case the Houbara Bustard, for the pleasure of the game of Falconry which is popular in the Middle East. Falcon's are the national animal of UAE and are considered as a form of pride for Arabian men and the Royal family who also love hunting pigeons or other endangered species. In Muslim court, Turkish and Persian poetry, these falcons are also associated with the sun, light and royalty, because it was commonly believed that as extremely brave creatures, they could fly close to the sun. Therefore falcons were the emblems of the Turco-Mongol rulers, who were even named after those birds. Some of the Mughals were addressed as "Falcons" as well. In these works, the UAE dirhams banknotes are cut in various forms of Mugal princes and dignitaries holding a falcon which is itself printed on the money. In the past, Mughals were like Arab Sheiks/Royals of today. 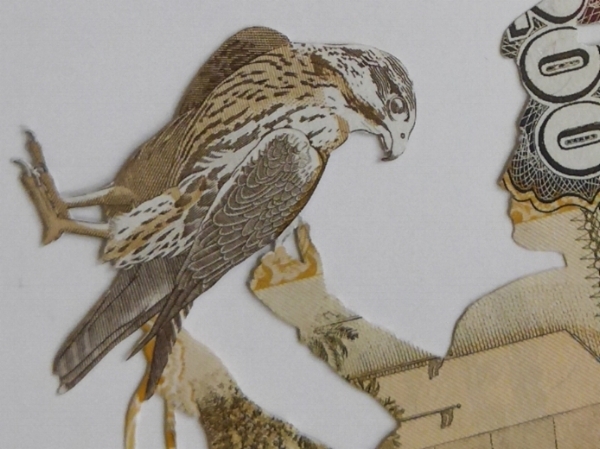 Counting Falcons (Assembly series) raises concerns. One is the current state of Pakistan and all the political incorrectness around the issue of the royal hunting expeditions of Houbara Bustard (a rare and endangered bird species with a mythical reputation) by the Arab Royalties, and the other is the misuse of power and finances in the Middle East which is also being exploited by Pakistani government for their benefits.